"One of the best affordable hotel in Da Nang." Have a question for Rainbow Hotel? 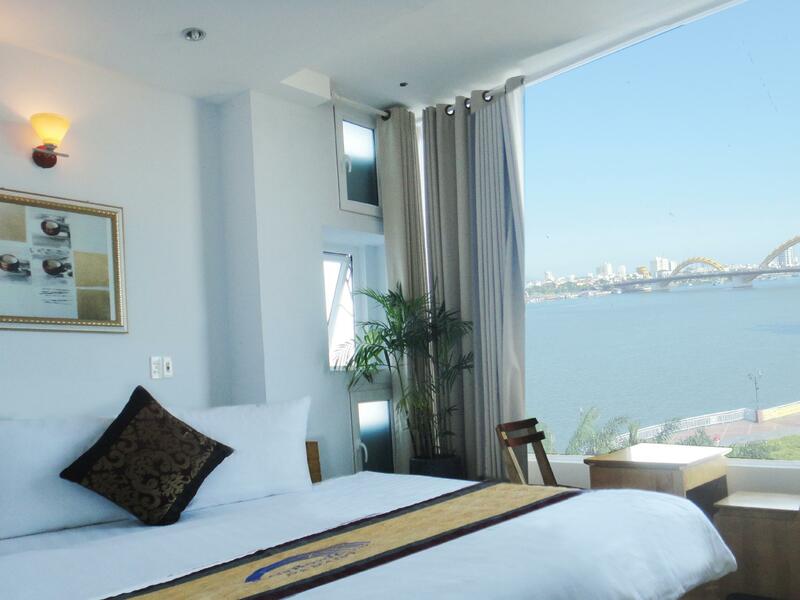 For travelers who want to take in the sights and sounds of Da Nang, Rainbow Hotel is the perfect choice. Situated only 1 km from the city center, guests are well located to enjoy the town's attractions and activities. Also within easy reach are Pheva Chocolate, Chicken Church, Danang Cathedral. At Rainbow Hotel, the excellent service and superior facilities make for an unforgettable stay. 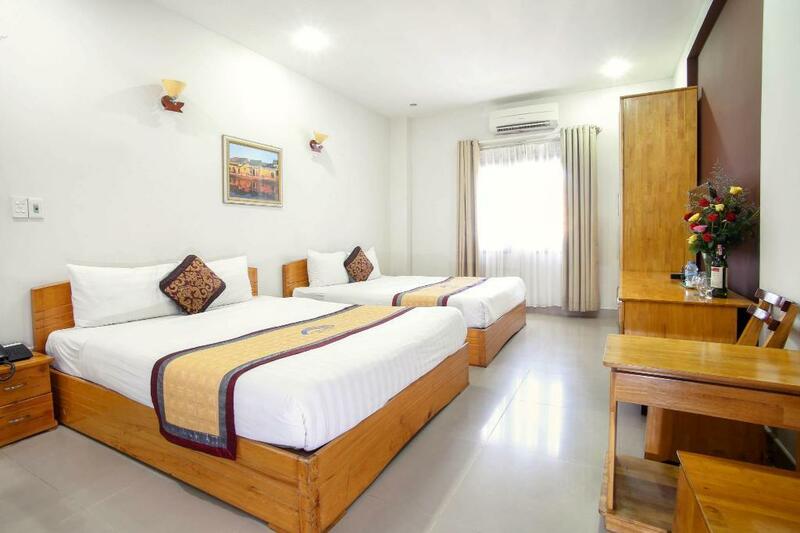 While lodging at this wonderful property, guests can enjoy 24-hour room service, free Wi-Fi in all rooms, Wi-Fi in public areas, car park, room service. All guest accommodations feature thoughtful amenities to ensure an unparalleled sense of comfort. Besides, the hotel's host of recreational offerings ensures you have plenty to do during your stay. 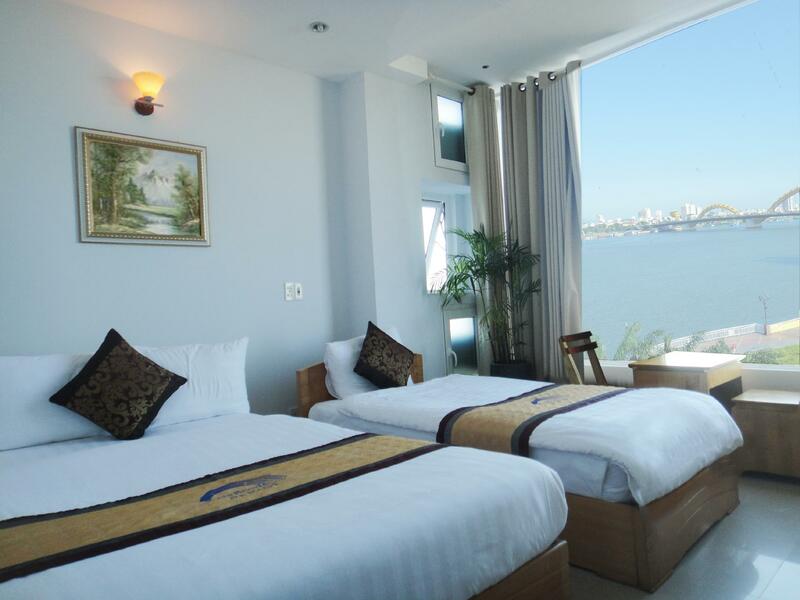 Rainbow Hotel is your one-stop destination for quality hotel accommodations in Da Nang. Rainbow Hotel was one of the best that I've stayed in in Vietnam. Staff would go out of the way to make sure that we had what we needed. Rooms were clean and comfortable, and the location leaves nothing to be desired. I'd highly recommend it to anyone who's looking for value for their money. We only had one night to stay at Rainbow Hotel so initially we didn't expect much, but the hotel and its staff certainly exceeded our expectation. Apart from the obvious things like the location overlooking the river and the fact that the hotel itself is very new, we were very impressed by the coziness that we felt when we set foot inside its lobby, and the staff were definitely the most welcoming we have met. They were ever so polite and helpful and seemed so sincere despite the constant influx of guests. I would like to hereby compliment one of the staff members, Ly, for her help and the friendliness that made us feel right at home. The blurb means what it says - "River view" doesn't necessarily give a full view of the Dragon Bridge. From our 3rd floor room, the bridge was mostly obscured by trees. That said, it was still very good at night when all the bridges and many of the buildings along the river are lit. In any case, if you want to see the dragon spout flame and water, you need to cross the river to the head side, where we found a bar one floor up on the N direction, giving a fabulous view. The show is on Saturday ( and I believe Sunday as well), at 21:00, and lasts for just 5 minutes. Dear Ms. Avril, We would like to express our sincere thanks for choosing Rainbow Hotel as your accomodation in Da Nang. 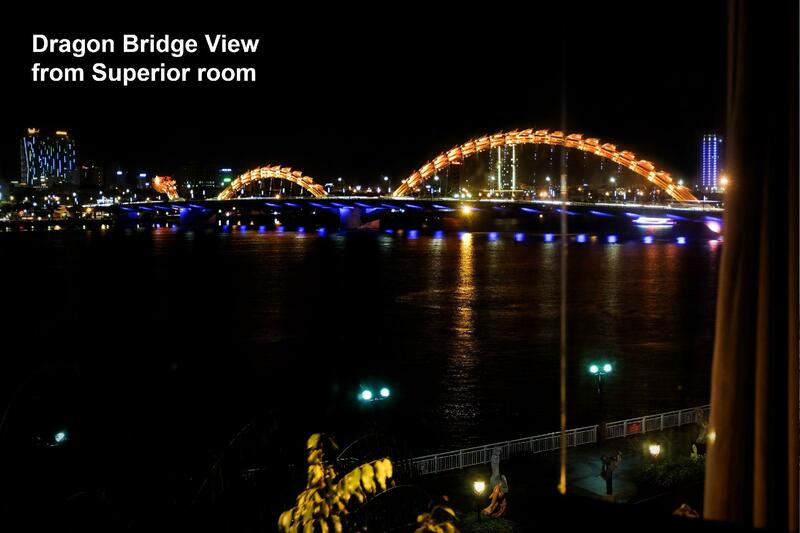 We always try to bring you a comfortable stay with amazing views of Han River and Dragon Bridge. Thank you for your sharing about your experience at Rainbow Hotel, we look forward to welcoming you again at our hotel one day. Wish you and your family all the best. Riverfront view and location, breakfast in room, affordable. Triple room is on highest floor and has to be accessed by stairs from floor below. Located along riverfront with views from room balcony. Breakfast is served in room, probably because there is no breakfast area. Wooden room floor is worn. Simply furnished, not a boutique hotel as described in Lonely Planet guidebook. This hotel was centrally located to the attractions I wanted to see in Danang. It is on the river promenade with nice views of the bridges at night. The room service style breakfast was unusual and takes getting used to. A good hotel for the price. Very nice & clean room. Breakfast excellent. Facing riverside. Located right infront Han riverside. Like the hotel especially order to cook breakfast. 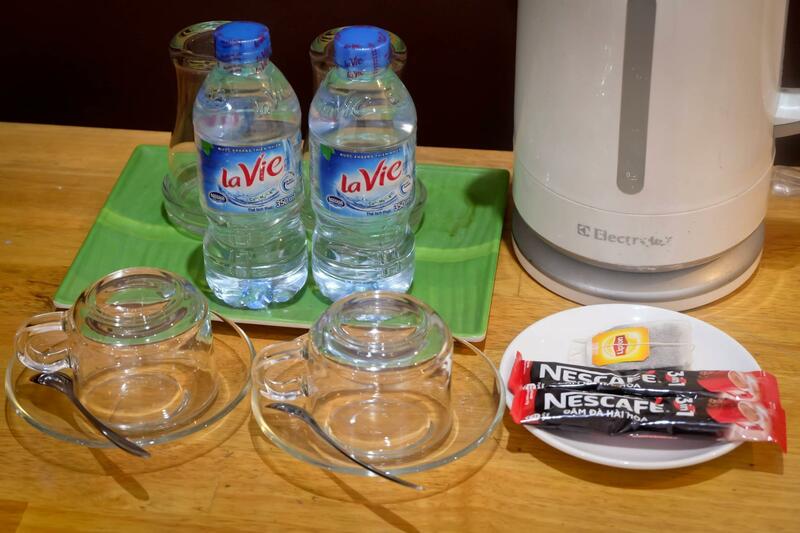 Serve local brew vietnam coffee. Clean room with effective AC.Book the front view facing river to enjoy night view of the Han River. Will recommend this hotel to friends. Breakfast was excellent. Staff LY personally attend to us bcos the waitress does not speak english. Good riverside night view. the boss and staffs are quite warm and help. take us to marble mountain and offer good price to train station and to hoi an. particularly, when i back to danang from hoi an by taxi to visit doctor due to fever, staff even guide me to hospital in holiday and translate for me! it is really good memory for me and i will definitely choose it if i have chance to go back to here. btw, view is good and can see the firework in the midnight just above the river. we were happy with the rainbow hotel. the views across the river were great. there is an amazing dragon bridge opening in march 2013 which will be a major feature for danang. the room was comfortable and the balcony fine for two people to stand out on. The rainbow hotel is conveneniently located in central Danang. Although Danang does not get great reviews we found it a great city to explore with the picturesque river running through the middle. The hotel was located here and the staff were freindly. The hotel itself is getting a little run down however the shower worked well and the bed and linen were clean and comfortable. We requested a balcony room and ended up on the top floor with great views of river, city and mountains. For the price the was a comfortable and easy place to visit. we initially booked for 1 night but stayed 2 more as we were very pleased with it. the staff were lovely and although their english wasn't brilliant, we managed to communicate andcrack a few jokes along the way. they were all young and cheerful and very keen on making our stay comfortable. breakfast was quite an adventure but we had the best omelette so far, including those we had had at 5 star hotels. the rooms were basic but well provided, very clean too. we thought it was one of the best low budget hotels we had been to in vietnam. Location couldn't be better. Bars, cafes, restaurants, and Han River just outside your door. Our room (316) had a fantastic view. This hotel is easy to get to and has very attractive rates, considering its exceptional location. The staff were friendly and helpful. Negatives: our room, though clean, was quite small and the walls really needed some fresh paint. The included breakfast was disappointing but edible. All in all, Rainbow Hotel is a great choice for travellers on a budget. The hotel located along Han River. The traffic in the early morning will be your wake up alarm. Overall room cleanliness is OK but could be improved better. Staff is helpful and friendly, able to communicate in simple english which is much better than any other locals. Great place for an overnight stop. We arrived very late and they were ready for us and very helpful. Room was clean, bed was comfortable and from our room we had a lovely view of the river. The staff are very friendly with varying levels of English. Breakfast was included and it was fine but don't expect to have any choice. my parents and 1 uncle stayed just for a night they encountered power cut during the night. so no electricity throughout, slept with doors slightly opened! too hot! bathroom was a bit dirty, room quite small considered they have a triple room, no space to put luggages. the hotel does provide breakfast but they dont have a dining area so breakfast was served in the room but coffee or tea has to be taken downstairs. quite odd since they could have just brought it up to the room together with the food. staffs with super attitude, i would employ them if i do open up a hotel! they keep apologizing about the bathroom's cleanliness. Good hotel for a one night stay. Not a lot to do in Danang but the hotel is on the Riverfront and within walking distance of quite a few decent places to eat. The rooms are simple and ideal for people looking to stay close to the airport. Breakfast provided in your room at the time you prefer - "room service" style. Simple bright rooms, river side rooms provide a good view. small friendly family hotel. there was nothing really i could fault this hotel on.gorgeous helpful ladies checked us in and we found the staff very friendly and helpful.this hotel is excellent value and with good breakfast served in our room and the rooms were always perfectly clean the staff are just amazing and really go the extra mile and a special thanks for the way you looked after us during our two week stay. boss name mr chieu serve and the staff serve us very well.special thank you to upgrade our room to provide better services,he is a gentle and nice guy.the staff also treat all the people with true heart and love.we will back again to rainbow hotel when we visit danang next round.appreciate and nice to meet you all. We stayed in a superior twin room. The room was quite lovely though all of the capboard were swollen and did not close. The bath room was the best we have found so far. One of the disadvantages was that nobody could speak English. this is a simple, but clean hotel. rooms are simple, breakfast is simple. but, you are not paying a 5-start price. so, i give it a high rating because they are definitely not trying to rip you off. i know because i live in vietnam. the rooms are simple, but clean. the breakfast is an omelet and fresh bread (really nice bread). if you are expecting a 2-star hotel you will be pleasantly surprised by this hotel. our family took 3 rooms for the price of one room at even a 3-star hotel. so, you can't beat the value. the location is also great. right on the river. not far from the beach. you won't be disappointed if you know what you are getting.